The Ford F-150 took the top spot away from the four-year champ, the Toyota Camry, on Cars.com’s 2013 American-Made Index. Cars.com ranks models by analyzing the percent of domestic parts used in the vehicle, where the final assembly of the vehicle takes place and the vehicle’s sales numbers. Bloomberg says that the F-Series is experiencing the largest growth in U.S. sales so far this year. Sales through the end of May are up 22 percent from last year. 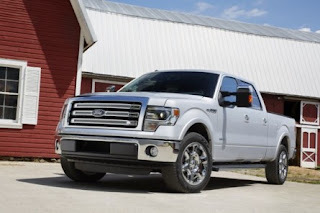 The F-150 has 75 percent of its parts made in the U.S., according to the National Highway Traffic Safety Administration. Overall, there are only 14 vehicles on NHTSA’s 2013 American Automobile Labeling Act Report that are assembled in the U.S. and have at least 75 percent of their parts made in the U.S. or Canada compared to 20 in 2012. Even though the F-150 beat out the Camry this year, Toyota still has more vehicles on Cars.com’s list than any other automaker. The Toyota Sienna ranks fifth, the Toyota Tundra is seventh and the Toyota Avalon is 10th. Olsen notes that purchasing an American-made vehicle isn’t a priority for every vehicle buyer out there, but he says it’s important for consumers to know that buying an American-made vehicle isn’t limited to buying only a Ford, Chrysler Group or General Motors vehicle.